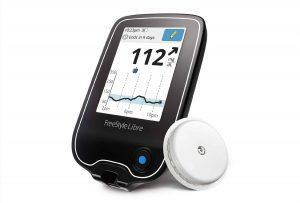 Technologies used to manage diabetes are constantly changing. For the most part, that’s a good thing — it means that new and often improved options are continually available, which can offer increased convenience, greater precision, or a proven ability to better manage your blood glucose levels. But the downside of this dynamic is that it can be hard to keep track of what options are available from which manufacturers, and what developments loom on the horizon. So for this article, we’ve compiled a list of the most promising currently available and soon-to-be released technologies in the areas of insulin pumps, continuous glucose monitoring (CGM) systems, and apps for diabetes data management. Each of the featured technologies has either received approval from the U.S. Food and Drug Administration (FDA) already or is expected to do so within the next year. We didn’t include technologies that are still in earlier development stages. They’ll be technologies to watch in a future year! Here are 10 technology offerings to watch — and possibly consider using — in 2019.
t:slim X2 Insulin Pump. Image courtesy of Tandem Diabetes Care. The latest pump from Tandem Diabetes Care aims to help people prevent hypoglycemia (low blood glucose) by predicting ahead of time when someone’s blood glucose level will drop below 80 mg/dl. The pump’s new predictive response feature, which it calls Basal-IQ Technology, can suspend insulin delivery in response to predicted low blood glucose levels 30 minutes before they actually drop dangerously low. It does this by syncing with the Dexcom G6 Continuous Glucose Monitoring (CGM) System and looking at patterns in glucose levels to predict where they’re headed. Once glucose levels begin to rise again, insulin delivery resumes. This feature is also available to existing pump users whose pumps predate the latest update. “Our ability to provide remote software updates, allowing in-warranty t:slim X2 Pump users the ability to add Basal-IQ Technology to their current pumps using a personal computer, is unparalleled in the industry and further differentiates the t:slim X2 Insulin Pump from other devices on the market,” says Kim Blickenstaff, president and CEO of Tandem Diabetes Care. The company offers study data showing that t:slim X2 users spent 31 percent less time with blood glucose below below 70 mg/dl, compared with participants who used a CGM-enabled pump without the predictive system. While this system can help people prevent hypoglycemia, the company notes that it isn’t a substitute for active diabetes management. One reason for this is that it depends on a CGM system and your pump’s infusion sets working properly, so you still need to check your devices and blood glucose levels regularly to make sure that nothing strange is going on. Dexcom G6 CGM System. Image courtesy of Dexcom. 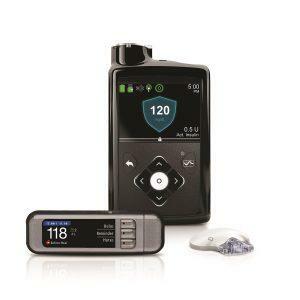 The Dexcom G6 is the company’s latest CGM system, and it includes several new technologies and capabilities. 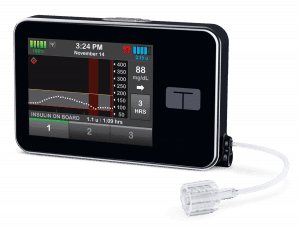 Most prominently, it’s the first FDA-approved CGM device that can communicate with insulin pumps designed to adjust your dose of insulin based on CGM readings (such as the t:slim X2 Insulin Pump, previous page). The G6 is also approved for use as a standalone device to make treatment decisions based on your glucose level — without the need for fingerstick tests before taking action. Fingerstick tests also aren’t needed to calibrate the device. The company has also redesigned its sensor applicator to make insertion easier, and sensors can now be worn for 10 days at a time. The new transmitter is 28 percent lower in profile than previous Dexcom transmitters. The device can also issue what’s known as a Predictive Low Alert when it senses that your blood glucose will soon be dangerously low. 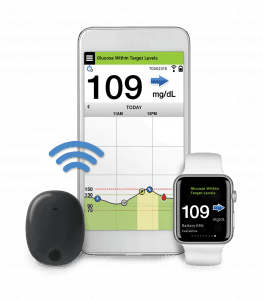 As with previous generations of Dexcom CGM systems, the G6 can automatically send your glucose readings to a compatible smart device every 5 minutes. Guardian Connect CGM System. Image courtesy of Medtronic. This CGM system was designed with connectivity in mind, and employs a sensor that works with iOS devices without a separate receiver. It’s meant to appeal to people who inject insulin, since it works independently of any insulin delivery system. The Guardian Connect offers predictive alerts 10 to 60 minutes before glucose levels reach a high or low level, which show up on your phone. Glucose readings are also stored on your phone, and can easily be accessed and viewed in different formats using the dedicated app. Predictive alerts “fill a key gap that exists in diabetes treatment today: how to predict dangerous highs and lows so they can be potentially avoided,” says Annette Brüls, president of diabetes service and solutions at Medtronic. The system also includes an app called Sugar.IQ, which aims to help people understand their daily glucose patterns and the factors that affect their readings. 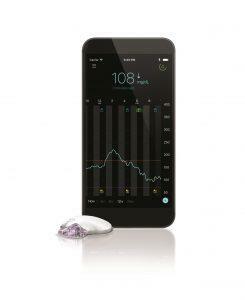 The Guardian Connect offers what Medtronic calls the lowest-profile CGM sensor/transmitter available, which weighs in at 5.7 grams (0.2 ounces) and is 9 millimeters (0.35 inches) thick. Each sensor takes about 2 hours to “warm up” and can be left in place for 7 days. The transmitter, which sits above the sensor, is rechargeable and lasts for at least 6 days per charge, according to the company. 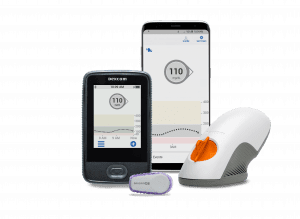 WaveForm, a subsidiary of blood glucose meter manufacturer AgaMatrix, announced the results of the 12th clinical trial of its CGM system in June 2018. According to the company, its system was tested for extended use of its sensor, which it expects to be approved for wearing for 14 days. It also aimed to match or beat the performance of Abbott’s FreeStyle Libre CGM system (outlined on the next page). The company touts several advantages of its system, including rapid and painless insertion of its sensor, a new-sensor “warmup” time of one hour or less, and glucose level reporting every minute. “We feel that recent clinical trials of the WaveForm CGM system demonstrate a powerful combination of extended wear, performance, and ease of use, unmatched by current industry leaders,” says Mihailo Rebec, chief technical officer of Waveform. Rebec also notes that the company’s technology positions it to offer new products in the near future, such as a potential “closed-loop” glucose monitoring and insulin delivery system. FreeStyle Libre CGM System. Image courtesy of Abbott. Abbott’s FreeStyle Libre offers several improvements over its previous CGM system, the FreeStyle, which it launched in the United States in 2017. These include a 14-day sensor wear time, a new-sensor “warmup” time of just one hour, and slightly more accurate readings than the previous system. The new system is also approved to make diabetes treatment decisions without fingerstick tests, and has the longest sensor life of any device currently on the market to gain this approval. It doesn’t require fingerstick calibration. The FreeStyle Libre has been in use around the world for several years already, with over 800,000 users, according to Abbott — making it the world’s most popular CGM system. SugarBEAT is bucking the CGM industry trend of longer sensor wear times. Instead, it uses an adhesive skin patch that gets changed daily, which sits under a rechargeable transmitter. The transmitter delivers the sensor’s results to a smartphone, tablet, or watch, or to an optional stand-alone reader. The adhesive patch works differently from other CGM sensors, according to creator Nemaura Medical. It passes a low-level electrical current across the skin, which draws glucose molecules from the interstitial fluid beneath the skin into a chamber in the patch, where it can be measured by the transmitter device. The company asserts that SugarBEAT will offer users greater flexibility, since it can be worn on nonconsecutive days — unlike other CGM systems that require 10 to 14 days of continuous wearing. It also aims to make the system cheaper than its competitors, with costs comparable to traditional fingerstick tests. SugarBEAT is expected to launch in the United Kingdom in 2018, followed shortly by a wider European launch. In the United States, clinical trials have begun as part of the FDA’s requirements, with an expected submission for approval in the first half of 2019. The Omnipod DASH is a tubeless, low-profile insulin pump that’s worn on the skin and can deliver up to 200 units of insulin over 72 hours of continuous wearing. It consists of the pump itself, known as the Pod, and a handheld controller device known as the Personal Diabetes Manager. 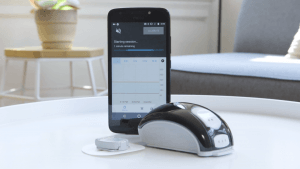 The system can connect wirelessly with the Contour Next One blood glucose meter, allowing users to calculate insulin boluses based on fingerstick test results. The system can also connect to a smart device via Bluetooth to keep track of blood glucose and insulin delivery information using an app called Omnipod Display. While the Omnipod DASH doesn’t feature integrated use with any CGM system, data from a Dexcom CGM system can be configured to be viewed alongside data from the DASH on a smart device. Eversense CGM System. Image courtesy of Senseonics. Eversense is the first long-term CGM system to use a fully implantable sensor. Instead of applying a sensor yourself that lasts for a number of days, your doctor numbs an area of your upper arm and inserts a sensor under the skin that can be left in place for up to 90 days. A removable, rechargeable transmitter is worn above the sensor on the skin surface. This device sends your glucose levels to a compatible smartphone, where you can check them using an app. The app can issue predictive alerts when it senses that your glucose level will be high or low in the near future. The transmitter itself also issues three types of alerts when your blood glucose gets too high or too low: lights, sounds, and vibrations — even when your phone isn’t nearby. One Drop Automated Decision Support. Image courtesy of One Drop. One Drop is a digital platform for diabetes data management and education. It includes a mobile app, a Bluetooth-enabled blood glucose monitor called Chrome, and a personal diabetes coaching service. One Drop’s mobile app is the centerpiece of its platform, and it can be synced with a number of different blood glucose monitors to store and analyze your data (One Drop Chrome syncs with the app automatically). Starting in September 2018, the app began offering a feature called Automated Decision Support to a small pool of eligible app users. For this feature, the app takes a user’s blood glucose reading and analyzes it by referencing 1.3 billion data points from over 1 million app users — data that covers food intake, physical activity, use of medications, and blood glucose readings. The user then receives a report in the app predicting future blood glucose trends, and is advised how to take action if a drop or spike in glucose is predicted. Since Automated Decision Support relies on data from millions of users, it doesn’t require using the app for an extended period before trends can be spotted. The feature was initially available only to users with Type 2 diabetes who don’t use insulin, but One Drop declared its intention to expand the feature to a wider range of users over time.